Awhhhhh Soup to warm your innards! The Best onion soup ever! Made this last night. So good! Five Stars! Used white wine instead of red. I HAVE to find some used soup crocks!!!! This sounds perfect!!! 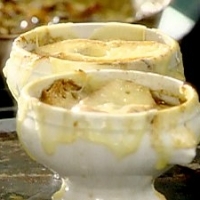 Sounds good, love French Onion soup, I'll make this when the weather here cools off some. I will be trying this recipe this winter. Sounds really good!